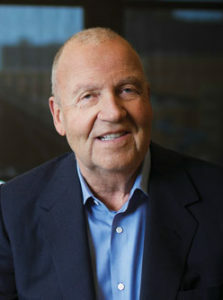 MINNEAPOLIS—From the renovation of an old Howard Johnson hotel in the Twin Cities to owning, operating and managing hotels from coast to coast, CSM Corp. has certainly grown from humble beginnings. Beginning in real estate in 1976, CSM—Colonial Service and Management at the time—acquired, developed and renovated properties across the country. The move to hospitality in 1992 was a leap of faith for CEO Gary Holmes, but one that was well worth it. 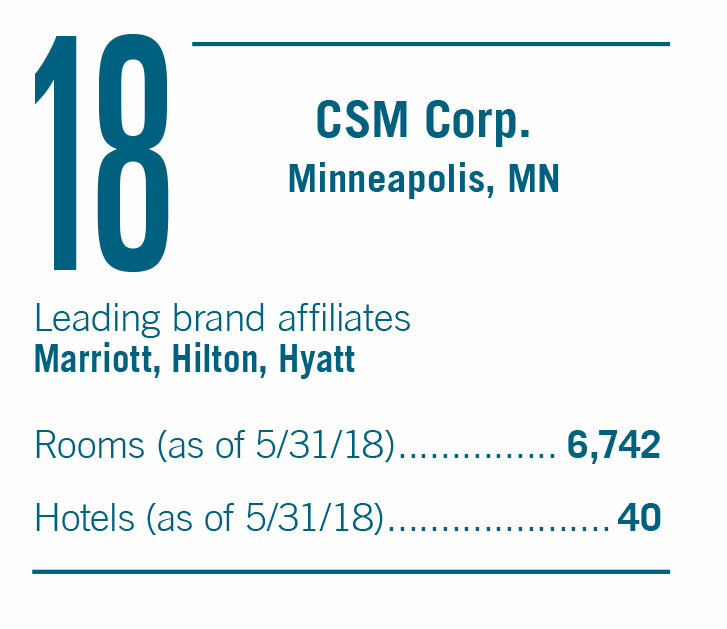 Since then, CSM has built or owned more than 50 hotels around the country with more than 6,600 guestrooms in its current portfolio, working with brands such as Marriott, Hyatt and Hilton, and offering full-service, select-service and extended-stay properties. 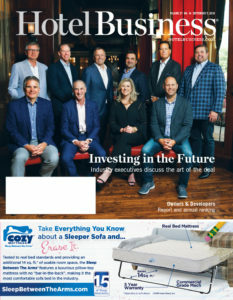 “What we learned from that experience was that even when you expand into a new business sector, focusing on quality, details and building for the long term creates a great foundation for getting it right,” Holmes said. Even before real estate and lodging, however, Holmes pursued another passion—raising money and giving back to his community as a Boy Scout. “I’ll admit to being a lifelong and incurable entrepreneur… That’s taken me in a lot of different directions over the years. As a Boy Scout, I found ways to raise money for our pack by organizing a sales network to sell popular items door-to-door, like long-lasting light bulbs and Durasan cartridges. There was an enormous market for these items, and kids who really worked at it earned money. Through a series of ventures like these, I saved up enough to buy a couple of duplexes,” Holmes said. Although a lucrative activity for Holmes and something that bolstered his entrepreneurial spirit, it was also humbling, instilling values that would shape the rest of his career and the core of CSM’s culture. This work ethic has allowed CSM to grow in Washington, Oregon, Arizona, Colorado, Wyoming, South Dakota, Minnesota, Iowa, Wisconsin, Illinois, Michigan, Massachusetts and Florida with more than 2,000 employees. Last year, CSM opened the dual-branded Aloft/Element Seattle Redmond, next to the Microsoft campus in Seattle. Other dual-branded properties, all located in Minneapolis, include the Renaissance Minneapolis Hotel, The Depot/Residence Inn Minneapolis Downtown at the Depot and the Minneapolis Marriott West/Courtyard Minneapolis West. According to Holmes, two brands and service levels in the same location give guests more options and offer cost savings in construction and operations. CSM is seeing an increasing demand for event center space, however, a market that the company is looking to capitalize on. CSM has an additional 26,000 sq. ft. of event center space currently under construction at the Renaissance Minneapolis Hotel, The Depot, which will double the size of its event center capacity. Holmes also recognizes that along with the need for ample event space, the guest is inevitably changing, expecting innovative additions to properties as well. 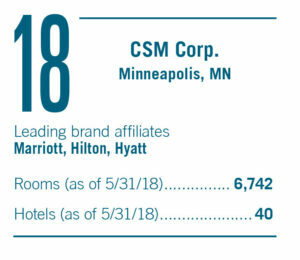 While hotels need to continually adapt, what sets CSM apart, Holmes explained, is that it owns, operates and manages almost all of its properties, allowing the company to foster long-term relationships within communities. “This gives us a depth of expertise and a strong connection to each property. Instead of buying and quickly selling properties, we tend to buy and hold them, resulting in construction that is higher quality, built to last and flexible for future use,” Holmes said. With an eye for renovation, CSM also looks for properties with history that an updated design can enhance. 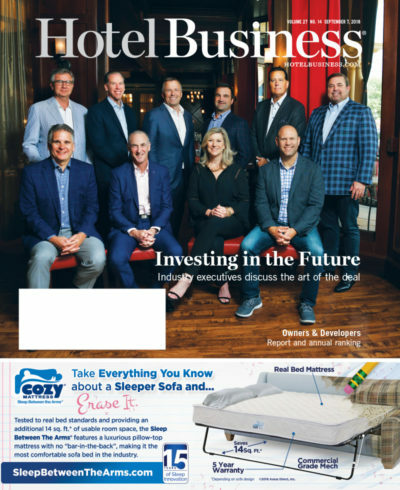 “What many don’t know is that we have developed a unique niche in successfully redeveloping and transforming historic spaces into destination hotels that revitalize communities and connect the past and future together,” Holmes said. This includes the Renaissance Minneapolis Hotel, The Depot, which was originally an 1890s train depot that had long been abandoned and was in a state of massive disrepair. “Today, it’s a key part of the community and after several years of room expansion and hotel renovation, we’re now doubling the size of the event center to keep up with demand for the unique space,” Holmes said. According to Holmes, CSM has also renovated downtown Milwaukee’s Gimbels/Marshall Field’s historic landmark building into a Residence Inn by Marriott and has restored the Art Deco, Phoenix skyscraper—which was featured in the opening sequence of Alfred Hitchcock’s Psycho—into a Hilton Garden Inn. “It takes hard work to restore and renovate while preserving the history, but they have resulted in some of our most rewarding and beautiful properties,” Holmes said. Rewarding work isn’t anything new for Holmes and CSM. Holmes learned the importance of philanthropy and supporting local communities early on. Holmes said his Scout pack helped sandbag communities during floods and assisted paramedics at parades. Now, CSM is continuing that commitment, donating time to organizations such as Ronald McDonald House. “Our workers care a great deal about having a meaningful impact on their communities, and there’s even more we can do to build on that. It builds on our commitment to our company values in a way that serves the community, gives back to people who need help and strengthens the quality of who we are as a company,” Holmes said. Core company values always come back to people and relationships, and both Holmes and CSM employees look to extend these to the guest experience.